Stay indoors as much as possible to keep healthy, safe and warm. Make sure to check on friends, family members and neighbors who are especially at risk from cold weather hazards: young children, older adults, and the chronically ill.
For outside activities, dress in multiple layers of loose-fitting clothing. Don’t forget to wear a hat, scarf and mittens, or other winter gear. Heat your home safely. 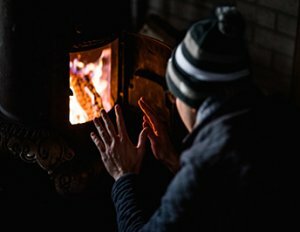 If you plan to use a wood stove, fireplace, or space heater, be extremely careful. Make sure each appliance is properly adjusted and you have followed the manufacturer’s instructions and local building codes for use. Prevent carbon monoxide (CO) poisoning by never using generators, charcoal grills or gas grills indoors and by installing a CO detector to alert you of the presence of the deadly, odorless, colorless gas. Watch this #FLHealthMinute video to learn more about how to prevent CO poisoning. As temperatures dip below freezing, leave your home’s water taps slightly open so they drip continuously. Eat well-balanced meals to stay warmer. Avoid drinking alcoholic beverages—they cause your body to lose heat more rapidly. Instead, drink warm beverages such as hot chocolate or hot tea to help maintain your body temperature. If you have any dietary restrictions, consult your doctor. Cold weather can displace wild animals. Stay clear of wild or feral animals including cats, bats or raccoons especially if they look sick or appear injured. They could have rabies and hurt animals can also injure you. Watch this video on rabies prevention to learn more. For more information, visit the Centers for Disease Control and Prevention’s page on Winter Weather Preparedness.